It was the Victorians who popularized the romantic cottage garden. A disconnect had arisen between what it was really like to live in the country versus the gentry’s ideal of a simpler life. The romantic cottage garden was part of this movement. The basis of the design should encompass a mix of old fashioned flowers in gentle swaths of color. The trick is to find a way to make the area look like a riot of color while still maintaining a look of simple design. Of course many of the traditional cottage plants that you see surrounding cottages in England, do not do well in the typical Atlanta summer, so choices have to be adjusted accordingly. Cottage gardens are best designed on a small scale. A single border or corner works well, or two parallel borders enclosed in a hedge to delimit the area. The placement should take into account the design of the house and grounds as a whole. Putting a cottage garden in front of a formal classically designed house will not be particularly appropriate. However, if you have a colonial or salt box style house surrounded with a picket fence, then a cottage garden will look very much in place. Any property though can create a small cottage garden in a nook or walled garden, or even surrounding a sunken pool area. Typical plants for cottage gardens are pastel colored when in bloom. Whites, pinks and blues are more common than screaming reds and oranges. When making your choice, look for a succession of color, just as you would if you were designing any garden. Old fashioned frilled daffodils in spring will be a great start, followed by spring blooming perennials such as tiarella (foam flower) and coral bells. The design should have no more than three colors in bloom at any one time. Too many colors cause the riot to look messy and out of control rather than romantic. For summer blooms look for pale colors in phlox and old garden roses. Pick old style roses that have scent, if possible, rather than modern ones that were bred for flower arrangements. Hollyhocks and gladiolus make great perennials to grow in the back of a cottage border and lavender goes well as either a single plant or as a border hedge. Boxwood also makes an appropriate edging hedge for a cottage garden. 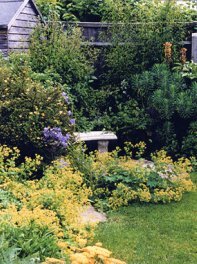 Cottage gardens will always be a popular style of garden design as they provide a romantic and casual atmosphere in a busy world, so consider putting a seat or bench in your cottage garden so that you can tarry a while and relax.